As an MBTI® practitioner I’ve spent the last decade studying everything I can about personality type and the brain itself. Helping people understand themselves gives me a huge amount of joy and contentment. But sometimes we all take it too far and assume things about people based on their personality type that have nothing to do with Myers-Briggs theory (or Jung’s original theories) at all. Many articles that I write talk about the most likely manifestations of a type. For example, if you read an article called, “7 Reasons Why You Need an ISFJ as a Friend”, you might think that every single ISFJ will be exactly like the friend described. These types of articles tend to describe average or healthy versions of a type and don’t account for things like mental illness, unique individual traits, and environmental factors. As an effort to clear up confusion and clarify what the MBTI® actually can or can’t tell you about yourself, I’m writing up this article to explore the truth behind the system. All of us enter a flow state more easily when we’re using our dominant mental process. Here is a list of the dominant mental processes for each personality type. You can click on the functions to learn more about them. Your dominant mental process is the one most likely to put you into a state of flow. It’s the process that energizes you the most. If you’re an extrovert, this will be an extroverted process. You’ll get your energy from the outside world. If you’re an introvert, this will be an introverted process. You’ll get your energy from the inner world of ideas, reflections, and impressions. The MBTI® is a tool that shows your preferences, not your abilities. Prefer judging (even though you can enter a perceiving state). Does this sound confusing? Think of it in terms of how well you use both of your hands. Unless you’re ambidextrous you prefer one hand over the other. If you are right-handed it doesn’t mean that your left hand is lifeless and paralyzed. It simply means that you are more capable with your right-hand. 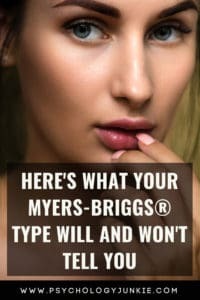 In the same way, the type code that you get when you take the MBTI® only tells you which preferences are more natural to you. If you’re an extrovert – You prefer interaction with the outside world to form the basis of what’s real. You like to test things based on how they show up in real life. If you’re an introvert – You prefer inner analysis and reflection. The inner world is where you get your energy and your impressions of what’s real. If you’re an intuitive – You are more interested in the abstract than the literal. What exists is only interesting as a starting point for what could be. Theories excite you. If you’re a sensor – You are more interested in the real than the abstract. You use what exists and you prefer factual, proven information over theories. If you’re a thinker – When faced with a decision you prefer the impersonal, logical approach best. If you’re a feeler – When faced with a decision you prefer to look at the intrapersonal or interpersonal effects of that decision and how it aligns with your values. If you’re a judger – You like to have your outer world organized in order to achieve your goals. You like knowing what to expect and you prefer to finish one project before starting another one. If you’re a perceiver – You like to have your inner world organized more than the outer world. You like having flexible plans and prefer to be adaptable and spontaneous rather than have a strict schedule. According to the Myers-Briggs theory, you are stressed when you have to use your less-preferred preferences for a great deal of time. As an ISFJ, for example, having to act as an extrovert for an extended period can wear down your energy. Having to be adaptable and spontaneous most of the time can cause anxiety. This doesn’t mean that you can NEVER do those things. It only means that living that way the majority of the time will stress you out. You can find out more about type and stress here. Intuitives tend to use a lot of metaphor and analogy in their speech. Sensors tend to speak more linearly and literally. Thinking types are usually more direct when giving criticism and feeling types are more likely to sugarcoat criticism. There are definitely ways that your personality type will influence your speech patterns and the kinds of topics that you find interesting. It will take a lot of time to detail the communication styles of each personality type in this article, so if you want to find out more about that you can check out my article about type and communication here. Type and intelligence are not related at all. Many people assume that if they get a thinking result that they literally think more. Others think it means they are inherently more logical. Others think that it means that they’re less emotional (not true). All that a thinking or feeling preference will tell you is what information you prioritize when you make a decision where either perspective is an option. Feeling types and thinking types can both do well at math, they can both empathize, they can both react rationally in a chaotic situation. Being a thinker doesn’t mean you’re a calculator who wears pants. Being a feeler doesn’t mean you’re a walking, talking, blithering ball of emotion. Thinking isn’t related to intelligence. Feeling isn’t related to being emotional. Your ventromedial prefrontal cortex (called the vmPFC for short) is involved in the cognitive evaluation of morality. It’s what we use when we process risk and fear and inhibit emotional responses so that we can have self-control and make the right decision. We use it when we have courage or stifle a negative emotional response because it wouldn’t be socially appropriate. Now let’s look at another part of your frontal cortex, namely the dorsolateral prefrontal cortex (dlPFC). This part of your brain helps with your working memory, cognitive flexibility, planning, and abstract reasoning. The dlPFC is the highest cortical area that is involved with motor planning, organization and regulation. When we make a decision we all consider logic and emotions (unless we’re behaving immaturely or dealing with a cognitive impairment). So what does the T/F preference really indicate? All this tells us is that when you’re faced with a decision where either perspective is an option, you err on the side of impersonal logic (T) or personal ethics and values (F) most of the time. It doesn’t mean that you don’t KNOW the logical answer or the harmonious resolution, it just means that you usually choose one over the other. Thinking types can sometimes appear more detached than feeling types. Why? Because when they are faced with a decision they tend to step outside of their personal feelings and figure out what makes the most logical sense. Feelers, in contrast, tend to think about the people involved in the decision and how everyone will be affected or what feels right on an ethical level to them. But neither of these preferences indicate how nice you will be. How you use your E/I, N/S, T/F, J/P preferences will vary depending on your psychological makeup, your environment, how you were raised, whether or not you have mental illness, whether or not you’re dealing with addictions, and a plethora of other factors. As an example, many people think that Hitler was an INFJ, others say that if Jesus had a personality type that he would have been an INFJ. While I’d refrain from typing Jesus (I don’t think deities have to conform to personality types) this is an example of how type can show up completely differently for different people. The majority of healthy feeling types have a gift for understanding the emotions of other people. They want to create harmony, a feeling of empathy, and understanding. However, some feeling types use their preferences to emotionally manipulate other people, to create a negative emotional energy, or to motivate or influence people in an unhealthy direction. The majority of healthy thinking types have a gift for being unbiased and sensible in their decisions. They want things to make logical sense and they want to be fair and just. However, some thinking types use their preferences to logically get what they want while railroading over the needs of other people or the ethical considerations of the group. You’ll see some charts out there that say that certain personality types are completely incompatible with other types. Disregard those. Any type can be in a good relationship with any other type as long as each partner is healthy, mature, and understanding. Mutual commitment, trust, and shared values are vital in any relationship. Your personality type is a tiny part of the picture and should never dictate who is or is not worth your time. Did you find this article helpful? Did you hate it? Share your thoughts and insights in the comments! I really enjoyed this article. I enjoy all of the articles that I receive from you! I particularly appreciated this article because it is easy to get hung up on the seeming “rules” that define each type and it is nice to step back and see the big picture once in a while. I particularly like the section at the end about compatibility. Me and my wife were talking about this recently; she’s an ESTJ and I’m an INTJ. I was saying how I recognized that any type can live happily with any other, but I feel like our types specifically worked well together. We kind of fill in the areas where the other may lack. Thank you for making this post! I identify the most with the INFP, but I CAN act like a complete ESTJ at certain times, for example, if I feel that it’s required of me, or I’m stressed to the utmost. Thank you so so much for clarifying what MBTI will and won’t tell a person, especially when it comes to relationships. I think myself and a certain ESTP could get along quite nicely in a romantic relationship, but everyone says that INFPs and ESTPs simply don’t work together, which I think is wrong.